“Many parents are now tapping social media and mobile apps for “online tuition” to help their children” (Parents Turn To Apps For Homework Help, Amelia Teng). In essence the education system could approximate more closely to the technological characteristics of a digital world. 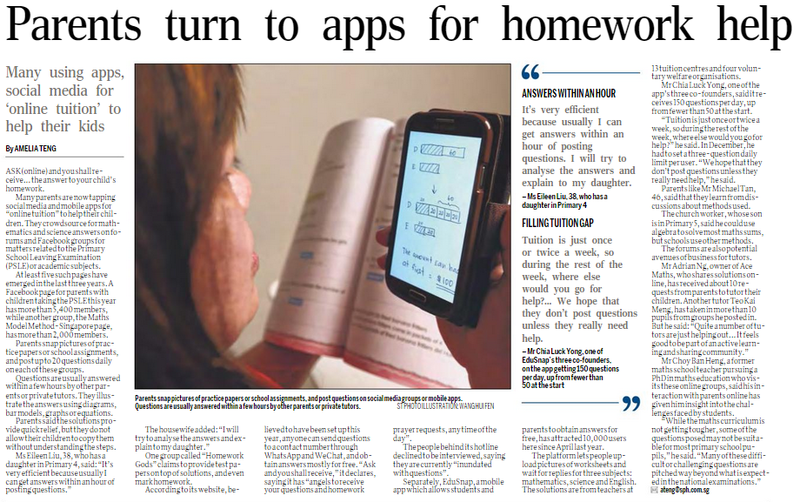 The phenomenon of parents turning to social media and mobile apps to crowdsource solutions to their children’s homework (ST, Apr. 26) may be dismissed by some as unfair attempts to game the education system, yet it would appear that these collaborative practices are not only reflective of student discussions which already happen within schools, but also of work environments in the future. These are hardly attempts at cheating, in other words. Since the advent of the Internet and mobile communication the mere mastery of knowledge has proven to be insufficient, and in this vein since schoolchildren have leveraged upon these technologies to complete assignments collectively it would make sense for them to use the aforementioned social media platforms and mobile apps to understand different solutions. Notwithstanding the fact that some parents struggle to solve these questions “related to the Primary School Leaving Examination or academic subjects” – which could hint at the difficulty of these assignments or even the inadequacy of pedagogies in schools – teaching students to find answers through online platforms encourages them to make good use of resources. Instead of taking what they find at face value they also learn to verify the sources, explore and practice with dissimilar methods, and ultimately gain a deeper comprehension of these subjects. Back when I was in high school discussions for homework or projects were common, and at the same time we understood that the onus was still on us, as individuals, to understand. Parents therefore facilitate this research process when they help evaluate the pros and cons of such crowdsourcing. In essence the education system could approximate more closely to the technological characteristics of a digital world. Unthinkable in the past, these small changes could also – to some extent – disrupt the mainstream tuition industry which has taken advantage of education inflation and the consequent information asymmetries. Knowing where to gather useful data and information and learning how to work collectively (without compromising on personal rigour) are skills which will remain applicable for a lifetime.